One hundred fifty years ago today, at the age of forty-one, Brigadier General Robert Selden Garnett, C.S.A., was shot and killed by a Union marksman. Garnett was the first general officer to be killed in the Civil War. Garnett’s lineage was already rich in history. His maternal grandfather was a French general, Jean Pierre de Gouges, and a great-great-grandmother, Olympe de Gouges, was executed in Paris in 1793 for “counter-revolutionary” writings. On his father’s side, his family had been making history in Virginia since the seventeenth century. Garnett’s great-grandfather, Captain James Garnett, was a justice of Essex, sheriff of the county, and a member of the House of Burgesses. One of Garnett’s first cousins was Alexander Yelverton Peyton Garnett, physician to Jefferson Davis. Another first cousin, Brigadier General Richard Brooke Garnett, C.S.A., would be killed in Pickett’s charge in 1863. An uncle was Major General George Mercer Brooke, U.S.A., of War of 1812 fame. Other uncles had represented Virginia in the Congress of the United States, including Robert Mercer Taliaferro Hunter, who had served both as speaker of the house and as senator, and Muscoe Russell Hunter Garnett of Elmwood, the one Garnett colonial house standing today. 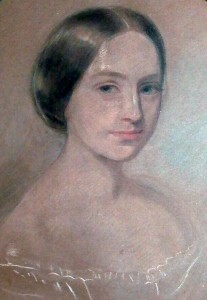 The latter’s wife, the daughter of Edwin A. Stevens, founder of the Stevens Technical Institute, first America’s Cup winner, and commodore of the New York Yacht Club, would be abducted from Elmwood during the war by Union troops at her father’s urging and not returned until after her husband’s death in 1864. 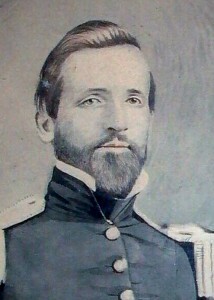 Garnett’s father represented Essex County in the house of representatives and appointed Robert E. Lee to West Point. Garnett himself was in the class of 1841 at the Point. Twice brevetted for bravery in the Mexican War, to captain and then major, Garnett was Zachary Taylor’s aide-de-camp when Taylor was elected president in 1848. In the spring of 1849, Garnett was sent by the new president with Congressman T. Butler King of Georgia to California to negotiate the newly won territory’s entry into the Union. It was Garnett who designed California’s state seal. From 1852 to 1854, while Robert E. Lee was superintendent at West Point, Garnett was commandant of cadets there. Recruiting in New York City thereafter, Garnett met Marianna Easton Nelson, the only child of a stockbroker, who was from New Bedford, Massachusetts, but then resided in winter on 40th Street, between Fifth and Madison Avenues. Marianna’s family was rich in history too. On her mother’s side, Marianna descended from a line of Quaker abolitionists. Her great-great-great-great-great-great-grandfather, Nicholas Easton (b.1593), built the first English house on the site of Newport, Rhode Island, in 1639, and was governor of Rhode Island from 1672 until his death in 1675. His son John, also in Marianna’s line, was governor from 1690 to 1695 and wrote a “Narrative of the Causes Which Led to King Philip’s War,” accepted as giving an unbiased account of the Wampanoags’ grievances. Marianna’s maternal grandmother was Ruth Brown of Providence. According to the letter Garnett wrote to his mother to announce the engagement, Marianna was “of fair complexion, blue eyes, light hair, slightly under the medium stature, slight of figure, but animate. Her expression of face is considered by all as very pretty and particularly indicative of gentleness and sweetness of disposition. Her mental qualities are good,” she is “very womanly in character, disposition,” and she has “most ladylike manners. She is all that I could desire her to be and eminently suited to my tastes.” By reputation, Marianna was one of the great beauties of New York, and Garnett one of the city’s most popular bachelors. On Tuesday, January 22, 1857, Garnett and Marianna were married there. On August 10, 1858, Garnett set out to round up and bring to justice a band of about 100 hostile Indians who had two months earlier attacked and turned back an expedition of California gold miners. When he left, his wife and child were well. On September 17th, three days before Garnett’s return, Marianna died, of “bilious fever.” She was twenty-six and had been married a mere twenty months. Her child outlived her by six days. 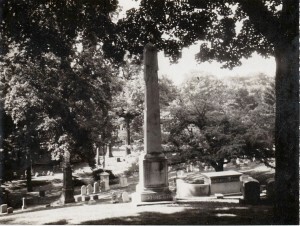 Garnett was given leave to take them back for burial in the Nelson family plot in the Green-Wood Cemetery in Brooklyn. He repeatedly extended his leave, travelling in England, France, and Italy, hoping never to return to the memories at Ft. Simcoe, and waiting for Virginia’s decision in the matter of the Union. Garnett did not return to the United States until April of 1861, and, on April 17th, in his last two-week extension of leave, Virginia seceded. Garnett resigned from the Army of the United States on April 30th. Shortly thereafter, he was named adjutant general of the Virginia forces, with the rank of colonel, under Robert E. Lee. On June 6th, he was raised to the rank of brigadier general. In July, Lee sent Garnett to save a desperate situation — to organize and control what seemed sure to be a costly rout of untrained and inexperienced Georgia and Virginia troops after the Union victory at Philippi, Virginia. Garnett’s retreat was very largely successful. Despite his being outnumbered six to one by McClellan’s troops, Garnett saved his army. Attempting, however, to cover his main column, which had just crossed over the Cheat River, Garnett posted ten sharpshooters in some driftwood near Corrick’s Ford, but, with an appreciation of the importance of setting an example that hardly seems conceivable today, did not take cover himself. It was not enough. As the Union troops appeared on the far side of the stream, according to Union accounts, the green sharpshooters fired one volley and then withdrew, save for one. Garnett turned and waved his scarf to rally them, and at that moment he was shot in the back. The one marksman who stuck with Garnett was felled by the next shot. The Union officers who came upon Garnett moments after he fell all knew him. One had been his roommate at West Point for four years. They posted a guard to protect his body from any indignity. On August 28, 1865, having been interred at Greenmount Cemetery in Baltimore for the duration of the war, Garnett was laid to rest next to his wife and child in Green-Wood. Garnett had erected an obelisk to their memory, but his own grave remained unmarked until this year. With their deaths, two family lines, woven deep in the texture of American history, and full of so much promise, came to a wasteful end. Annapolis Policy Issues is proudly powered by WordPress and Techy People Theme by Code & Stuff.